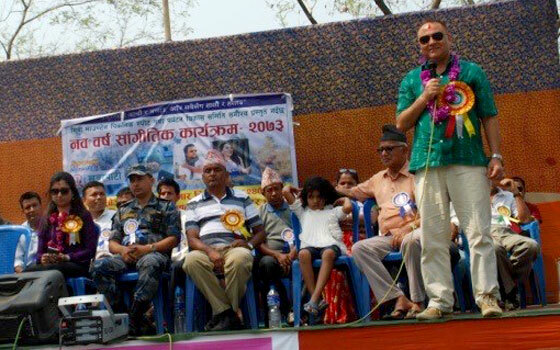 A day-long long national level campaign to promote tourism in Bahundangi was held 13 April 2016 in Bahundangi, Jhapa. The campaign was organized by the Mini Mountain Picnic Spot and Tourism Development Committee. As Bahundangi is one of the pilot areas of the Kangchenjunga Landscape Nepal identified for the implementation of activities, representatives from the International Centre for Integrated Mountain Development (ICIMOD) were invited to participate in the programme. ICIMOD’s Nakul Chettri and Pratikshya Kandel participated in the programme as a chief guest and a special guest respectively. Nearly a thousand people attended the programme, including local communities, representatives from local organisations, various social groups and political parties. The programme included representatives from all relevant line agencies, including local organisations, social groups, political parties and community representatives who were invited to give their remarks. Dr Chettri appreciated the local enthusiasm to develop tourism and committed his support for tourism activities in Bahundangi. The programme also included a cultural programme where the national and local artists performed. To develop Kangchenjugna tourism destinations, Dr Chettri and Ms Kandel visited six potential tourism sites in Bahundangi- Mini Mountain Picnic Spot, Krishna Thumki (sacred temple), Singhadevi Omkareshwor Tapodham (second biggest Ficus tree), Jordhara Hiledada (sacred site with potential water sporting and elephant view destination), Pau Pathivara (sacred temple), and Jamun Khadi simsar (park and zoo). The two met with local communities and key informants to collect information regarding current tourism conditions and potential. ICIMOD representatives also visited an area where electric fencing has been installed by the National Trust for Nature Conservation (NTNC) with the support of the World Bank to mitigate the human- elephant conflict at Bahundangi. The local community was very positive and say they have already witnessed change in agricultural productivity but remain concerned about its sustainability.